Dental problems can come out of the blue and cause a lot of pain, frustration and discomfort. Unfortunately, if you choose to ignore the pain in the hopes that it will go away, you may be worsening the problem and making it more complex. Because of this, we advise anyone experiencing a dental emergency to contact us immediately so that they can be seen. Not only does this get rid of the pain that you’re experiencing, but it prevents the problem from getting out of hand. Emergency dental care refers to dental work that is performed on an emergency basis. 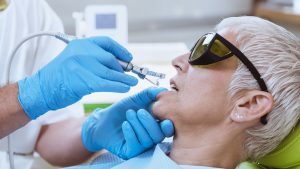 For example, a patient may come into the office with severe pain and upon closer inspection, it’s found that they are in need of root canal therapy because of decay. Emergency dental care is geared to correcting the problem and getting you back to living your life pain-free and without any dental worries or woes. It is important to call in whenever you are experiencing an emergency. Once you arrive to the office, an x-ray will be taken of the area and an exam is going to be done. This will help to determine the cause of your pain or discomfort and to devise a treatment plan specific to this need. You will then have any work done and can go home pain-free the same day.